Ask students: The city is in. If at one time America’s college-age population was sentt away to school in a cornfield, small college town, or hillside enclave, today they flock to cities, where urban campuses are growing and prospering, making new commitments to their cities, and at the same time enlarging their domain into neighborhoods scarred by urban renewal, urban abandonment, or both. Universities are occupying spaces in the skyline, taking over spaces vacated by businesses that have fled to the suburbs or relocated to more technologically equipped, 21st-century office buildings; they are building new housing and retail developments; and they are finding new ways of partnering with neighboring communities with an aim to avoid the territorial and intellectual antagonisms of the past. And yes, they are building new buildings, many by signature architects. As towns and their institutions of higher education grew, most often toward one another, the abstract intellectual conflict of town-versus-gown was actualized in physical conflict over space. New York City incrementally chased the fledgling Kings College (established in 1754, which later became Columbia University) to the northern reaches of Manhattan Island, until finally, lodged in Morningside Heights in the late 19th century, the university commissioned McKim, Mead & White to design a campus to protect itself from future onslaught. Many other colonial institutionssHarvard University, founded in 1636 in Cambridge, Massachusetts, and Yale University, established in 1701 in New Haven, Connecticuttgrew to become inextricably intertwined with their urban contexts. When these schools transformed into research powerhouses a century ago, they set the stage for the enormous boom in campus construction and of student populations. Student bodies have spiked steadily since World War II as a result of veterans’ enrollment programs, a shift to a service economy, and later, the baby-boom, the expansion of opportunity for women and minorities, and more recently to accommodate non-traditionall (older) students and the echo-boomerr generation. Many universities’ current urban strategies are the result of hasty decisions, failures of modernist planning and some of its architecture, and universities’ awkward participation in urban renewal a half-century ago. Yale and the University of Pennsylvania are hoping that their current participation in community renewal will reverse the urban devastation that occurred in part because of land banking in the 1960s. During that period, many schools cleared land in inner-city neighborhoods for buildings that did not materialize or expanded in ways that disrupted the urban fabric and neighborhood cohesiveness. 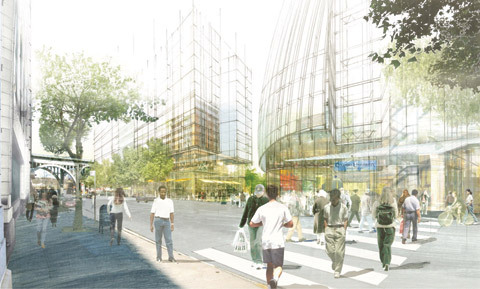 In contrast, Columbia University has reached out to its community in the process of planning its expansion into Manhattanville, promising new commercial prospects for the neighborhood and architectural transparency. Its president, Lee Bollinger, contrasts the proposal to the blank walls that the university presents in Morningside Heights. But the process must also be understood in relation to the debacle of 1968, when the school’s proposal for a new campus gym in Morningside Park fueled a massive student strike. Student activists linked U.S. involvement in Vietnam with the university’s attempt to annex neighborhood public space. How do sites that were once anathema to higher education find themselves now so intertwined in the future of American pedagogy? A major factor is the revival of cities themselvessnew strongholds for public architecture, cultural institutions, and models for working, living, and playing. In the 1980s PBS series Pride of Place, Robert A. M. Stern extolled the American campus for being a place apart,, and the New York University cultural historian Thomas Bender stated in his book The University and the City: From Medieval Origins to the Present (Oxford University Press, 1988), The university has always claimed the world, not its host city, as its domain.. But more recently social theorist and New School University provost Arjun Appadurai noted in an interview published in Items and Issues Quarterly 4 (Winter 200332004) that the blurring of the line between universities and corporations and the increasing globalization of students and research networks make cities such as New York ideal locations for higher education. Today’s academy is rarely a solitary retreat, despite a losss felt by some faculty. Perhaps echoing the thoughts of Thomas Jefferson when he was designing the University of Virginia, the architectural theorist Kurt W. Forster wrote in From Catechism to Calisthenics: Cliff Notes on the History of the American Campuss in the May 1993 issue of Architecture California, Lasting institutions like colleges and universities invoke a social rationale for their physical installations, a rationale that speaks to their overarching purposes and helps elucidate the ideas behind their operations. In our culture, we are educated to find in our surroundings the manifestations of character and purpose, particularly when those larger abstractions such as character, purpose, and meaning would tend to escape our immediate grasp.. Architecture is critical to pedagogy. From Jefferson to Henry Ives Cobb, McKim, Mead & White, Louis Kahn, and Eero Saarinen to today’s campus designers, the ideals of the campusswhere tradition and innovation, solitary contemplation and global interaction meet and debateemake it an ideal site for inspired architecture. An elegant tower at Lexington and 23rd Street began in 1847 as the first free higher-education establishment in the republic. Over time, it became the anchor of Baruch College. In 2001, when Kohn Pedersen Fox’s Vertical Campuss unsheathed 14 sloping stories above Lexington Avenue, Baruch suddenly evoked the fusty philosophy major who’d bulked up over the summer. The Vertical Campus, with running-board details at sidewalk level and glass and brick wings, drew critical praise for giving students a central kibitzing point. In the opinion of Vice President of College Advancement David Gallagher, the sloping tower fulfilled a 1986 Davis Brody Bond master plan by giving the scattered buildings a discernible heart. Baruch also wants its students (it has 15,500 of them, full- and part-time) to hew closer to campus, potentially with campus dormitories. 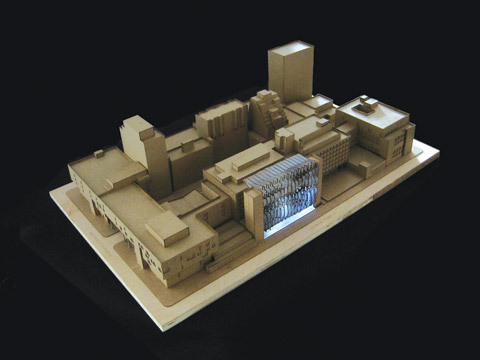 The school commissioned Gordon Kipping of New York firm G Tects (and Frank Gehry, whom Kipping assists at Yale) in fall 2004 to suggest a format in which buildings might connect. Kipping proposed filling the path between 17 Lexington Avenue and the Vertical Campus with new crowns on two existing courthouse buildings and a new structure with fluid setbacks. His sketchhwhich has no authority over the eventual plannsandwiched 17 Lex’s limestone skin in curvaceous glass sheaths. If Kipping’s study influences trustees, the new 23rd Street lobby could offer a triple-height atrium space for students. To the public, it would offer Jumbotron views of lectures, with closed-captioning, to let any stroller spend 50 minutes as a student. Let’s restore the idea of a free academy,, Kipping said. On September 15, Baruch named the building for donors Lawrence and Eris Field. Gallagher said the college will issue an RFP for a masterplanning firm on CUNY’s approved list, then wait 18 months for the plan. Budgets from Albany and City Hall would dictate the pace of expansion. Gallagher estimated that the unification will take 10 years. By then, Baruch could need another expansionnin cyberspace or Gramercy. The State University of New York (SUNY) at Buffalo occupies the heart of New York’s second largest city. But the school, whose original buildings straddle the city’s Main Street, also has a suburban identity: SUNY created a second campus in 1970 in Amherst, just 3 miles north of Buffalo, following the trend of urban flight that shattered most American cities in the 1960s and 70s. The school rejected the idea of expanding its main campus, including a megastructure proposal by native son Gordon Bunshaft and a downtown waterfront annex, instead commissioning Sasaki, Dawson and Demay to create a compact, inward-looking master plan at Amherst. But the school is trying to reinvigorate Buffalo, according to dean of SUNY’s architecture department Brian Carter, by bringing good architecture back to the city center. In 2002 the university commissioned Boston firm Chan Krieger to create a third center, called the Buffalo Niagara Medical campus, on a 100 acres of downtown land surrounding the university’s Roswell Park Cancer Institute. This complex has just seen the completion of the first of two new buildings: Last May, the school opened the Hauptman Woodward Laboratory building designed by Mehrdad Yezdani of Cannon Design in Los Angeles, a 70,000 square foot medical research facility (pictured). This laboratory will connect via a bridge to a second research facility, the 290,000-square-foot Center of Excellence in Bioinformatics designed by Francis, Cauffman, Foley Hoffman of Philadelphia, which opens in December. Both buildings give Buffalo what Banham suggested it needed for a full architectural recoveryynew buildings for economic and functional reasons, but one that are psychologically of high architectural quality.. The campus has also inspired SUNY’s school of architectureewhich is located just two subway stops awayyto launch a series of design initiatives on issues dealing with universal design and childhood obesity, for example. This interaction is something that Carter believes can work effectively on an urban campus, where diverse fields can come together to collaborate on research projects. The Cooper Union for the Advancement of Science and Art’s unusual tuition-free educational model is the driving force behind the architecture, engineering, and art school’s current building initiative. Most colleges rely on tuition as a steady source of income, but since all of the school’s 900 students attend at no charge, administrators are always looking for other financial resources to fill the gap. It’s a magnificent vision but a terrible business model,, said Ronni Denes, Cooper’s vice president of external affairs. Our current plan is geared at leveraging our real estate assets to ensure the school’s future financial stability.. The school’s real estate portfolio includes desirable properties such as the Chrysler building, whose rents provide more than half of its operating budget. The master plan, devised by a planning committee made up of trustees, aims to increase that percentage by cashing in on its properties concentrated around Astor Place. Cooper is not expanding like most universities with new master plans, but rather consolidating and modernizing its facilities. Said Denes, It’s in our interest to keep the school small and efficient.. Its engineering school will be moved out of an obsolete building from the 1950s and into a sleek, high-tech, nine-story building designed by Morphosis’ Thom Mayne (pictured) on the site of the old two-story Hewitt Building at 3rd Avenue and 7th Street, which Cooper leases from the city. The new building will also house the Faculty of Arts and Sciences and a public gallery and auditorium on the ground floor. The vacated property between 3rd and 4th avenues and 8th and 9th streets will be razed and leased to developers, in much the same manner as the nearly completed condominium designed by Gwathmey Siegel & Associates and developed by the Related Companies at Astor Place. The school will reach out to developers for the project, anticipated to be 14 stories high, once the Morphosis building breaks ground in June. The new building will house Cooper’s administrative offices as well as other private businesses. The school’s master planning committee hopes to have some review of the commercial development’s design, as it did with the Gwathmey Siegel building, and even its clients. According to Denes, Cooper would like to attract businesses with some kind of synergy with the school’s academics, such as architecture firms, artists’ studios, and biotech companies..
Cooper’s master plan does not include any gestures to unify the new buildings with their predecessors like the Foundation Building into a more recognizable campus. Our students don’t want to be walled in,, said Denes. We think of New York City as our campus..
With so much ambition and activity, a campus master plan seems long overdue. In fact, a year and a half ago George Ranalli, dean of the architecture school since 1999, was commissioned to produce one. His plan calls for closing Convent Avenue to create a more sheltered campus center, around which administrative offices would be dispersed, rather than lumped together as they are now in one of the college’s two large 1970s block-buildings, described by Ranalli as megastructures that need to be broken up..
To Ranalli’s frustration, however, his plan is on the back burner while the campus expands, as it has throughout its history, based on immediate needs rather than long-term vision. (In reaction to the school’s ad hoc development, Sorkin, who was a member of Ranalli’s planning team, has created his own alternative scheme.) We started working on a master-planning process four years ago, with open forums to talk about current conditions but things have not proceeded in a typical way,, said Lois Cronholm, chief operating officer of City College. For example, with the dormitory building [now under construction], we had a need, so we found a way for to fill it, quickly.. The dormitoryythe first for the traditionally all-commuter schoollis being designed by Design Collective, Inc., of Baltimore, and should be completed in 2006. Capstone Development Corporation is the school’s development partner; it will manage the facility for 30 years before ownership is transferred back to the school. The four new buildings are all located on the college’s south campus, a medley of architectural styles that stands in contrast to its historic north campus, a collection of buildings designed in 1905 by George Post. The biggest challenge is putting the south campus together in an integrated way, as soon as possible,, said Cronholm, who foresees no more new construction for the college in the near future, unless the dorms are successful, in which case, we’ll see.. The wait-and-see approach to planning appears to be the closest thing to a master plan the college has, and will likely continue to shape the campus. Of the major expansion plans being undertaken by schools in the New York City area, only one is planning to build an entirely new campus: In 2003 Columbia University hired the Renzo Piano Building Workshop (RPBW) and Skidmore Owings & Merrill (SOM) to create an ambitious master plan to guide the development of nearly 33 acres in Manhattanville, the neighborhood north of Columbia’s McKim, Mead & White campus. 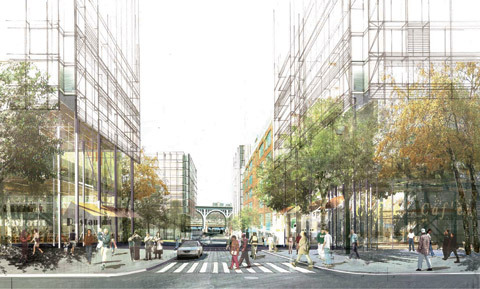 The $4.6 billion Manhattanville Expansion Project encompasses the blocks between 12th Avenue and Broadway, and 125th and 133st streets, and will be phased in over the next 30 years. The university owns 53 percent of the land within the proposed development site and the MTA owns about 20 percent. Columbia promises to work with residents to acquire the remaining property. Throughout its history, Columbia has had a tenuous town-gown relationship with its neighborhood. The 1968 controversy over the school’s proposal to build a gymnasium in Morningside Park was a key turning point in the planning of the university. Nearly 40 years later, the planning process for Manhattanville is transparent, cautious, and considerate. We’ve learned a lot from our past mistakes,, said Jeremiah Stoldt, director of Columbia’s plan for facilities management. We’ve met with block associations, the community board, and other local groups to present our thinking and gain feedback. A lot of aspects of the plan came from this feedback, such as preserving east-west axes and open space..
One of the plan’s strongest features is its call for improved links to the nearby Hudson River, which is now cut off by the West Side highway viaduct. The architects envision a park or other potential recreational sites. Taking inspiration from Fairway market, a neighborhood institution located between the neighborhood and the waterfront, Taylor envisions the creation of a marketplace or other compatible uses. You could close it down at night, for concerts, festivals, or fairs,, suggested Taylor. But it would have to be a community initiative. What we can do with our plan is include an active urban layer, such as retail on 12th Avenue, that would contribute to these sorts of possibilities.. In March, New York University (NYU) hired Sharon Greenberger, former New York City chief of staff to the deputy mayor for economic development, to fill a new post at the university: vice president for campus planning and real estate. According to Greenberger, the office she heads, which is divided into four sectionssplanning and design, space management, residential services, and real estate developmentt is still in its start-up phase. I’ve just started the hiring process, and the intention is to have a full staff in place by the end of the year.. Greenberger will be looking for architects and designers to fill positions, especially in the planning and design unit. According to Greenberger, the new division will not make any decisions about campus planning or architecture until the hiring process is complete. But the office is sure to be extremely busy in 2006. Created by university president John Sexton, who took office in 2001, the division serves in large part to unify the school’s scattered planning divisions in the face of an ambitious growth initiative which includes faculty recruitment and an expanding student body. This administration has ambitious plans for the university, which will put more constraints on space and provide more ambitious thinking about its growth,, said Greenberger. 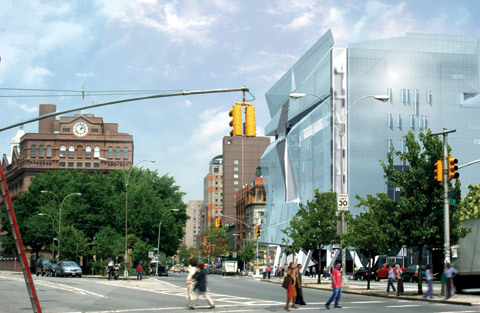 NYU is no stranger to large building initiatives and their complexities. In the 1980s and 90s, the school, then led by president John Brademas, underwent a massive campus expansion in Greenwich Village, which raised the hackles of many local residents and made it the city’s third largest landowner (the city is the largest; the Catholic Church the second). 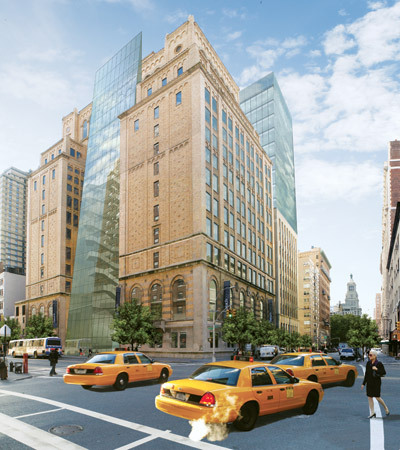 (NYU’s newest building is the 2003 Furman Hall, bordering Washington Square Park, by Kohn Pederson Fox, pictured left.) The creation of Greenberger’s post was meant partly as a gesture of openness toward the community. Figuring out how a school can expand in an urban environment while also being good neighbors to the community can be challenging,, said Greenberger. The administration recognized that it requires more expertise in the fields of campus planning and real estate to make that happen successfully..
You might feel tempted to flaunt technique when reinventing a design school. If that school sat smack between Union Square and Washington Square, though, you might seek a civic icon. At Parsons, Lyn Rice did both. His newly unveiled design for the Sheila C. Johnson Design Center (pictured) opens students’ doings to the street with triple-height lobby glass. Showcasing had been somewhat bass-ackwards throughout the eight-part New School, Parsons’ parent, which occupies 19 buildings strewn about the Village and now seeks a firmer identity along lower Fifth Avenue. The design school serves as its lodestar, now that Rice has rearranged it. The school’s most valuable real estate,, said Rice, at 13th Street and 5th Avenue, housed maintenance and trash collection. Rice decided to scoop outt the janitorial services to the basement for an upgrade. Replacing it, he installed 3-foot window frames with one long bench. The boundary between salon and sidewalk becomes a place for students to hang out..
It’s also, Rice said, a place for students to confront their mandate. The architect uses a glazed roof to create a light-filled urban quadd between seven banks of elevators. Rice describes this as tipping the classic college green on its side so that it fits in a highrise. In an urban quad, circulation is vertical in these elevator cores,, he said. The graphics lining the walls could rotate each semester, Rice suggested, giving students instant sidewalk critics. The New School’s quest for a more cohesive urban identity comes after decades without a master plan. Lia Gartner, its director of design and construction, is overseeing a suite of brand-boosting capital projects. She said the university seeks to show pedestrians the sense of this place being untraditionall and give students and faculty the best use of this miscellaneous collection of buildings..
Pratt Institute’s greatest asset, in architecture dean Thomas Hanrahan’s opinion, is its location in Brooklyn’s lively Clinton Hill neighborhood. Aptly, the new campus plan by Cooper, Robertson & Partners looks outward, with some major plans to expand the campus borders,, said Robert Scherr, director of Pratt Institute’s Facilities Planning and Design. Anticipating the school’s growth within the area, Pratt’s president Thomas Schutte took a leading role in the recent formation of the nearby Myrtle Avenue Brooklyn Business Improvement District (BID). 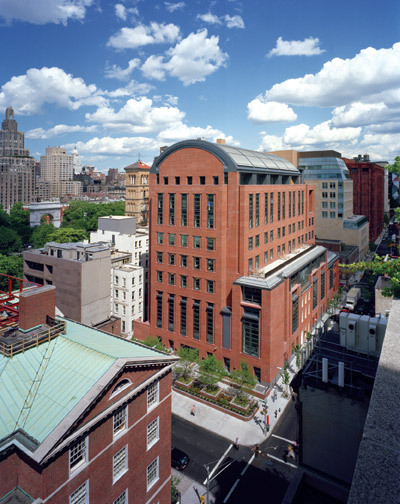 Like many local schools, Pratt owns a significant number of buildings outside of its main campus (Higgins Hall to the south, for example, and Myrtle Avenue to the north), and wants to strengthen their connections to each other and to the neighborhood and community as a whole. Although the Cooper, Robertson plan, which calls for the development of a digital art center, a student union, and a student services building, has not yet been fully ratified by the school’s board of trustees, the implementation of several initiatives is moving forward. A couple of projects were the result of large private donations, such as Juliana Curran Terian’s $5 million donation for the Design Center Entrance Pavilion, and Hiroko Nakamoto’s $50,000 donation for the new Pratt security kiosk. Years of deferred maintenance were the impetus for campus-wide upgrades: Many of the student dormitories, faculty housing, administrative facilities, and the Main Building are currently finishing major renovations. The largest current project on campus is the Design Center Entrance Pavilion by dean Hanrahan’s firm, Hanrahan + Meyers Architects. In an effort to combine all the principal design programs into what will be the largest design center in the United States, the new entrance and gallery will create a connection between Steuben Hall and the Pratt Studios. The entrance is currently under construction and will be completed in 2006. The largest project outside of the fence involves the Higgins Hall complex, which houses the School of Architecture. Rogers Marvel Architects is overseeing major interior renovation while Steven Holl Architects designed a new central wing (pictured) which brings together the hall’s north and south wings in a single entrance and exhibition space. 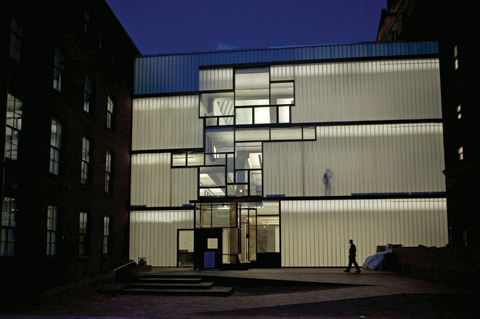 The Pratt Store, designed in-house by Pratt’s office of Facilities Planning and Design, located on Myrtle Avenue and Emerson Place, was completed in December 2004. This design reflects the institute’s goals of strengthening the surrounding community by bringing new services and activity to the neighborhood. Yale has long been a patron of great architecture, commissioning important works from Eero Saarinen, Gordon Bunshaft, Paul Rudolph, and Louis Kahn. The university’s current building initiative continues this legacy. Gwathmey Siegel & Associates recently took over the job of designing an addition for Rudolph’s famed Art and Architecture building. The addition will house an arts library and classrooms for the art department that are currently located in the Rudolph building, allowing the architecture school to expand into the newly-freed space. (The addition was originally commissioned to Richard Meier & Partners in 2001 but in December 2003, the project was sidelined with the loss of a major donor. The project picked up steam again this summer when a new donor emerged. Though Meier’s scheme was complete, Gwathmey Siegel will begin the project from scratch.) 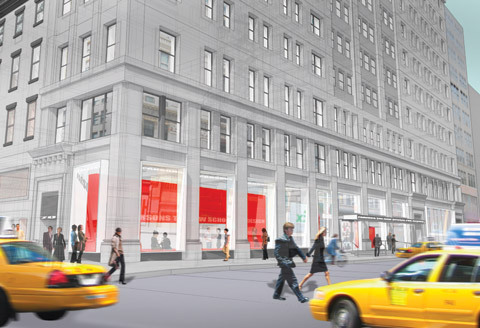 Skidmore, Owings & Merrill is overseeing the renovation of the original Rudolph building while Polshek Partnership Architects has recently been retained to renovate Kahn’s Art Gallery. The arts campus expansion is only a portion of a much larger group of projects recently completed or underway at Yale. 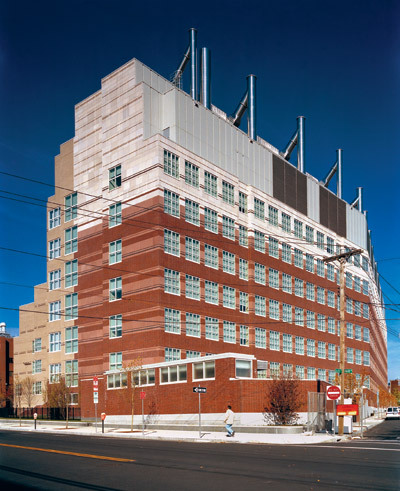 Some just-finished buildings include an engineering building by Cesar Pelli & Associates, a chemistry laboratory by Bohlin Cywinski Jackson, and a medical research center by Venturi, Scott Brown and Associates (pictured). According to Laura Cruickshank, who became Yale’s director of University Planning, Facilities Construction, and Renovation in July, The university is improving multiple areas of the campus simultaneouslyyScience Hill, the arts buildings, the central campus, and the medical school.. Projects currently in design include another building by Venturi, Scott Brown building for biology in the Science Hill area and a forestry and environmental studies building by Hopkins Architects. 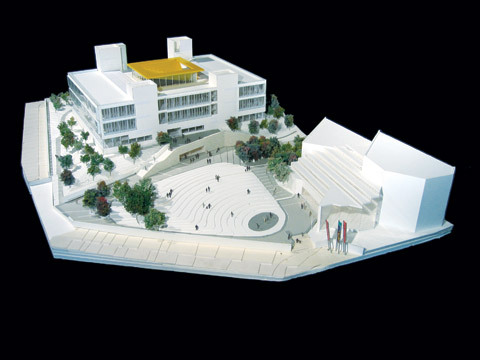 The massive building initiative is all part of a campus plan completed in 2000 by Cooper, Robertson & Partners, which outlined the development of new construction as well as landscape architecture, circulation, signage, and traffic. The so-called 20-year Framework for Campus Planning was Yale’s first attempt at creating a university-wide plan since the 1920s, and addressed the campus’ poor integration with the surrounding city of New Haven. With its gated courtyards and inward-facing Gothic building blocks, Yale’s campus plan, proposed by John Russell Pope in 1919 and revised in 1921 by James Gamble Rogers, originally contained a number of connective axes and public spaces that may have served to open the campus but were ultimately scrapped. Cooper, Robertson’s plan suggested that the university pay particular attention to places where its campus meets the cityyon its streets and sidewalks, and through its landscaping, lighting and signageeto help weave Yale and New Haven into a more cohesive urban fabric..